A cellblock wedding is reportedly in the works for the founder of Peru's Shining Path guerrilla movement. Abimael Guzman proposed marriage last fall and will wed his second-in-command Elena Iparraguirre on an unknown date, Iparraguirre told Caretas magazine this week. The longtime lovers are serving life sentences for terrorism in separate prisons. Throughout the 1980s and early 1990s, Guzman, 72, inspired a cult-like obedience among his Maoist guerrilla insurgency which grew to 10,000 armed fighters. Iparraguirre, 59, who used the nom de guerre Commander Miriam, expressed no regret about launching an armed struggle aimed at seizing power from the white elite. "We made errors, but the revolution was worth it because the Peruvian state was garbage," she said. The Shining Path faded after Guzman's capture in 1992. But rebel factions continue to operate in the coca-growing jungle region. 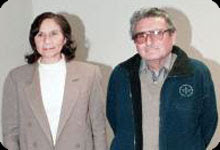 Iparraguirre did not say when the two might wed, though apparently Peruvian law does not prohibit the marriage and would, according to Caretas, allow them six conjugal visits a year.